Six years ago (while taking a shower! ), I came up with an idea for reminding myself how to live a happy life — I would ROLL with it! “Rolling with it” means to go with the flow, take whatever comes your way, and just live a happy life. R.O.L.L. stands for “Respect” (self and others), keep an “Open mind”, “Listen” and “Learn”. I’m working on the second and third stories now and can’t wait to share them with you all! Thanks so much for the support and here’s to “rolling with it!” each and every day! Social media is awesome for keeping in touch with family and friends all over the world. Our kids are on it almost 24/7 and it’s completely normal for them to go for long stretches without physically coming into contact with people. So here’s a question: do you keep in “touch” your kids when you see them? Do you hug them, hold them, tousle their hair, pat them on the back? If you don’t….you must! If it doesn’t come naturally, a good way to keep in “touch” is by holding their hand before they sleep. Sit on the side of the bed, ask to hold their hand, and give it a little squeeze and maybe even a massage as you talk about their 5 favourite things of the day. It’s a fantastic ritual and can be continued even when they’re older IF the practice is started when they’re younger. So today I decided to clean up my 18,000 plus messages in Gmail and came across this 12-step list in a tucked away tab labelled “Notes”. “Notes” are from my beloved Samsung Galaxy Note2 (which sadly I gave up when switching to the iPhone 6Plus — oh, how I miss the Galaxy pen!) so they’re definitely something I wrote, but since it’s from May 1, 2013, I can’t remember if I wrote them or if I copied them, or if I compiled them from things I’ve read or heard elsewhere? 1) I have influence over my child, not control. 3) I have faith in my child, even though I don’t always understand. 6) I will treat my child the way I wish to be treated when I can no longer care for myself. 9) I know that I must be happy for my children to be happy. 11) i know that I cannot be all things to everybody but I can be one thing to somebody. 12) I will be true to myself and allow my child to be true to himself or herself. I was going through the Rolling Stone’s top 500 songs the other day and something struck me as I listened to their #5 entry: Aretha Franklin’s version of the Otis Redding-penned “Respect”. With all due respect, we can’t have just a little bit of respect (unless it’s a euphemism for something else, but that’s another story!). Like death or, being more positive, life, respect is an absolute: You can’t be “just a little dead:” when you’re dead, you’re dead; and when you’re alive, you’re alive. And you either have respect or you don’t. The bedrock of any lasting, positive relationship is respect. Key words: lasting and positive. Because we can have lasting relationships that are negative, and we do it all the time — with our bosses, abusive spouses and free-loading friends. We also have positive relationships that are short due to people moving away, drifting apart, death, etc.. If we think about it, more often than not, when we see these people again, we tend to pick up right where we left off because our relationships are built on the bedrock of respect. And if there is one type of respect that trumps all the others, it’s self-respect. I was coming home in a taxi the other day and when we pulled up to where we live, the entrance was blocked by a taxi whose driver was arguing with the security guard about where he was allowed to wait for passengers (the apartment complex has only a very small entryway and is routinely blocked by moving vans, etc. so often the taxi stand changes). But on second thought, it became clear: if the driver had respect for himself, he wouldn’t have let his emotions get carried away to such a degree about something as little as being told he had to move his taxi. Easier said than done, that’s for sure! I know that I’ve gotten myself into more situations that I care to remember that have escalated beyond calm and that resulted in my feeling just horrible afterwards when I realise that I, too, share the blame or am to blame for what happened. That my lack of self-esteem or insecurity have caused me to lash out. “The driver will regret his actions upon reflection later on,” my taxi driver commented, then shook his head sadly, as if he wished he could reach out and help this poor fellow driver. How true! Self-respect begins with … the self! If you’re like me, learning the lessons of life growing up was all about other people: do unto others as you want them to do unto you. The focus being on ‘others’. I equated self-respect with ‘self-ish’ or ‘self-absorbed’, and as a result, ignored my own self in favor of others. How familiar does this sound to you? When my daughter was 12, she was taking violin lessons. She had chosen to learn the violin and liked her teacher, but one particular day that summer, she was in a foul mood, and in the afternoon before her lesson, she had gone into her bedroom and closed and locked the door while she did her homework. (Actually, I have no idea what she was doing in there, but respected her decision to be alone for awhile.) I watched the clock and waited, sensing that an almighty battle was on the horizon. About 15 minutes before the lesson, I knocked on her door to remind her it was nearly time to leave. Silence. Ten minutes before the lesson I tried again. This time, she proclaimed she wasn’t going to the lesson and nothing I could do would make her go. The gauntlet had been thrown! Suddenly it occurred to me that this had nothing to do with me. Or with her teacher. Or with the violin. But it did have everything to do her, and I had a great opportunity to show her that. I took a deep breath. “I know you will go, and you know how I know?” I said calmly through the door. I knew she was thinking of all the possible ways I would have for prying open the door and dragging her out forcibly, and she’d be dying to know so that she could tell me how it was NEVER going to happen. “How?” she finally demanded to know. “I know, because I know you.” I said. “Hah! You think you know me, but you don’t know me!” she shot back. Now I’d love to be able to say that she immediately acquiesced and opened her door and went skipping off happily to violin class, but it didn’t happen quite that way. There was a lot more back and forth through that closed door before that happened, but what’s important is that it did happen, and it happened because she came to realise that it was about HER and how SHE was going to behave. It wasn’t about me or me telling her about how to behave or ranting about the money or the teacher. It was making her realise that she HERSELF had the power to decide how to behave and to take responsibility for her actions in a way that would give her no reason to feel remorse and regret later. I have a horrible memory. I can’t remember names, can’t remember dates, can’t remember what I had for lunch today. I like to read books about how to keep a positive mindset, how to think positive thoughts, what to do when I face negative people or situations, but I can’t remember any of it when I need to. I was thinking one day if I had an easy way to remember, I wouldn’t let these kind of negative encounters affect me — they would go in one ear and out the other, roll off me like water on a duck’s back. I’d be able to roll with the changes, take whatever came my way, positive or negative and not be so reactionary. I started thinking about the word ‘roll’ and how rolling made everything easier…faster…more fun. R could stand for ‘Respect’: respect for myself and respect for others. O could stand for keeping an ‘Open mind’. L could stand for ‘Listening’ instead of assuming. L could also stand for ‘Learning’- learning to see things in different ways. So I’m going to ROLL on out of here now. I hope I’ll be able to remember what it all stands for the next time I come across someone or something negative. Which ice cream cone are you? On a hot summer’s day about eight years ago, I had an epiphany. To beat the heat, we had gone to Times Square in Causeway Bay to do some shopping with the kids. Just as we were about to leave we spotted an ice cream shop that sold trendy Japanese ice cream that staff transform into gigantic pyramids atop square sugar cones. We just had to have some. We were eagerly lapping our 6-inch-high pointed confections when my husband suddenly remembered that the meter where he had parked the car would soon run out. We quickly left the mall and, as usual, my husband and daughter steamed ahead while my son and I took our time. 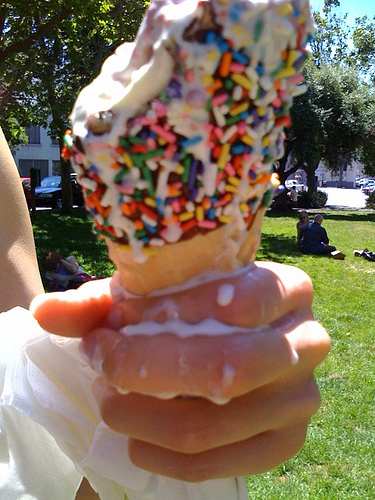 We hadn’t gone far when my son stopped because his ice cream was dripping all over the cone, his hand, and down his arm and clothes. I stopped to help him, while trying in vain to control my own melting cone. It was quite a task holding shopping bags, stemming the tide of two ice cream cones, and at the same time fishing for tissue in my black hole of a purse. Hearing my cry, they turned in unison. The first thing that struck me was their twin display of perfectly groomed cones. I was in awe. Perfectly licked with not a drip in sight, their cones looked almost like the plastic ones displayed at the ice cream shop! How was that possible? 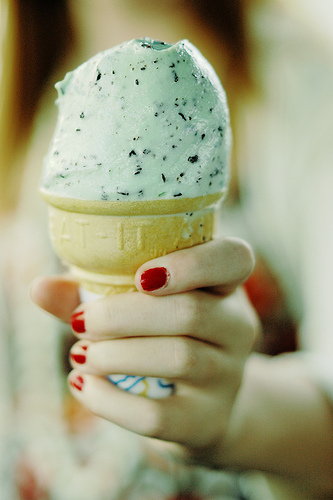 This is a ‘cool’ cone. Notice the perfectly polished nails! Instead of running back to help (as I would have done), they stood there in shock with a look of horror on their faces. Help!” I called again, then pleaded with my eyes, since I couldn’t keep yelling at them from across the plaza. I looked at my son and we burst out laughing at how out-of-control our cones were becoming. This is a ‘bumbler’ cone! That did it, I guess, for my ‘cool’ husband and daughter. They turned and started walking away! We finally got ourselves reasonably cleaned up and made our way to the car where my husband and daughter were seated in cool air-conditioned comfort, waiting for us patiently. “Why didn’t you help us?” I asked, more bemused than upset. “Mom, seriously? Did you see yourselves?” my daughter replied. “Why? What’s the problem?” I countered. “You are both such, such….bumblers!” she said, her face contorted in disgust, as if this were a thing to be avoided at all costs. She then tucked her hair neatly behind one ear, crossed her ankles daintily, and quietly went back to reading a book she had bought earlier that day. My husband gave me a similar look (and a smile) in the rear-view mirror as he started the car. They didn’t deign to reply. I looked at my son and we both shrugged. “Bumblers forever,” I whispered conspiratorially. He nodded and we both grinned, confident that while we may not have perfect ice cream cones, we are perfect in our own way! This is something that just came to me today, but I’m sure it’s not an original thought. Have you heard this before? Let me know! The next time someone wants to talk with you, listen with your eyes. Ears are for hearing; eyes are for listening. Stop reading; stop playing with my iPhone; stop working on the computer. Look up and listen with your eyes. Look up and listen with your eyes.